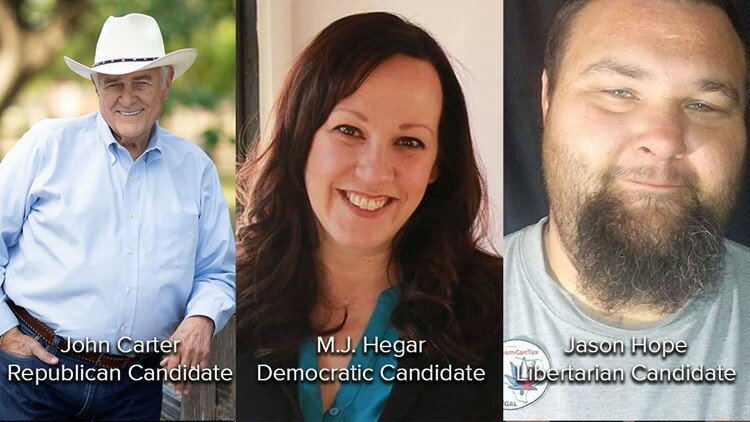 WILLIAMSON COUNTY — U.S. Rep. John Carter (R) is set to face military hero M.J. Hegar (D) in a race for Texas District 31 U.S. Representative this November. The Texas 31 congressional district covers a strip of Central Texas from North Austin up to Temple, Texas, and serves most of Williamson County. Democratic candidate Hegar received national attention after her political ad campaign went viral back in July. Hegar served three years in Afghanistan as a rescue helicopter pilot and earned a Purple Heart after her aircraft was shot down and she engaged in combat. She earned her bachelor's degree from the University of Texas at Austin and has fought to open all military jobs to women after partnering with the ACLU. For more information about Hegar, visit her website here. Libertarian candidate Jason Hope will also be on the ballot for Texas District 31 House Representative. For more information about Hope, click here.